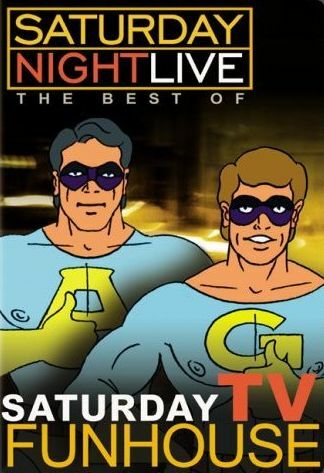 Saturday Night Live- The Best of Saturday TV Funhouse is a basically a collection of those animated skits that they show on Saturday Night Live. Called "Saturday TV Funhouse", sometimes the skits are funny, and when they are they're usually REALLY funny. However, sometimes they're just flat-out boring. Thankfully, this is a best-of collection, so pretty much all boring ones aren't here. Yeah, I said "almost". There are a few of those "Fun With Real Audio" ones, which I just always find lame. This is where they take some real audio clips, usually from politicians, and then come up with some animation that doesn't really seem to relate to what the people are saying. Those just aren't my cup of tea. All of the other skits, however, are fantastic. They range from pretty funny to laugh-out-loud hilarious. It's actually pretty hard to pick a favorite. I really liked the Disney Vault, and Smurfette, and The All New Adventures of Mr. T, and Shazzang, and... yep, as I thought, there's just too many really good ones to be able to pick a favorite. In total, there are whopping 31 skits in the episode. But that's not all! The extra features contain even more skits. Some of them are just extended uncut versions of the ones in the show, but others are completely separate skits that they just didn't have the time to work in. There's also one or two that never made to air. Audio commentaries by Robert Smigel, Steve Crell, Stephen Colbert, Mr. T, Al Franken, and a bunch of other people are also part of the extra features, as is some original art and storyboards. The show is hosted by the animated duo Ace & Gary. Known as the Ambiguously Gay duo, they are a parody of classic type superheroes, but what makes them so funny is that they unintentionally use homosexual double entendres for pretty much everything they say and do. So, if you were unaware, this is definitely not one for the kids, but it is actually a pretty good DVD. Of course, that's assuming you like rude, crude cartoons mixed up with double entendre. Saturday Night Live- The Best of Saturday TV Funhouse was released on October 24, 2006 by Universal Studios Home Entertainment. Check out the official website for more information and clips.